James Healy, born a slave, became the Roman Catholic bishop of Portland and founder of the Diocese of Manchester in the late 19th century. He has been called the first African-American bishop, though he was three-fourths Irish and nearly everyone thought he was white. He was the oldest of 10 children born to Michael Morris Healy and his biracial common-law wife, Mary Eliza Clark (sometimes referenced as Mary Eliza Smith). Michael was a southern plantation owner. Eliza was his slave. Healy was an unusual man who harbored ambitions for his children. Three became nuns, three became priests and one had a successful career in the Revenue Cutter Service. James and his brother Patrick rose to positions of great influence within the Roman Catholic Church in America. Michael Healy was born in County Roscommon, Ireland. He served in the British Army in Canada during the War of 1812 until he deserted. He then moved to rural Georgia near Macon and won a substantial plot of acreage in a land lottery. Michael eventually acquired a 1,500-acres cotton plantation. He also acquired 49 slaves and a library of 100 volumes that included books on religion and philosophy. In the late 1820s, Michael Healy became sexually involved with Clark, a teen-aged slave. 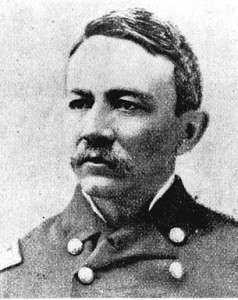 Beginning with James Healy, born on April 6, 1830, they had 10 children. Michael acknowledged all of them. The rigidity of racial distinctions had to be maintained as much as possible. The idea that a person might be able to cross over from one race to another was out of the question....The distinction between "white blood" and "black blood" came to seem so fundamental that any attempt to mix the two had to be censured. The twisted logic of slavery depended on the maintenance of clear dividing lines: slaves were black, blacks were slaves, and it had to be that way. Georgia law forbade Michael Healy from marrying Mary Eliza Clark. It also forbade him from freeing her or their children, legally enslaved. And since they were slaves, Georgia law forbid them from being educated . So in 1837, Michael Healy began sending his children, and later his wife, north. There they passed as white. James Healy and two younger brothers, Hugh and Patrick, attended Quaker schools in Flushing, N.Y. Their father came to know Bishop John Fitzpatrick of Boston. Fitzpatrick then arranged for the boys to enroll in the College of the Holy Cross in Worcester, Mass. James Healy earned a B.A. from Holy Cross in 1849 and declared his intention to enter the priesthood. But he couldn’t study at the Jesuit seminary in Maryland, a slave state. Fitzpatrick, who knew of his parentage, helped him enroll in a Montreal seminary. Then he helped James enroll the Sulpician Seminary in Paris. In 1854 he was ordained at the Cathedral of Notre Dame. Fitzpatrick stepped up to help Healy again and made him his secretary and chancellor of the Diocese of Boston. Neither revealed that James Healy had African-American blood. 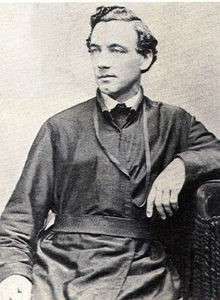 In 1866 James Healy became pastor of St. James Church, Boston’s largest Roman Catholic congregation. He spoke out against the General Court’s attempts to tax Catholic Churches. He also founded several Catholic charities to aid Irish immigrants who arrived in Boston during the famine years. James Healy bought a wooden frame house in Newton, Mass., where he lived with his brothers and sisters. The siblings remained close over the years. 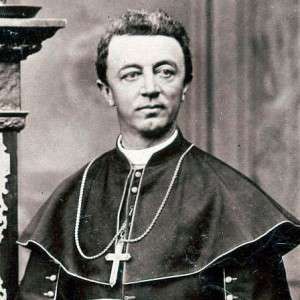 In 1875, Pope Pius IX appointed James Healy bishop of Portland. He presided over the diocese for 25 years. Healy supervised the creation of the Diocese of Manchester and established 60 churches, 68 missions, 18 convents and 18 schools. He also excommunicated members of a labor union, the Knights of Labor, the only member of America's Roman Catholic establishment to do so. James Healy completely identified as a white man. Apparently members of the African-American community knew enough about him to ask him for help. When a young African-American seminarian from Maryland asked to come to Portland to work as a priest, Healy refused. Pope Leo XIII named him an assistant to the Papal throne two months before he died on Aug. 5, 1800. Three of James Healy's brothers – Patrick, Hugh and Sherwood – graduated from Holy Cross. Hugh went into business and died at 21. Patrick joined the Jesuit order, earned a PhD and in 1874 was named president of Georgetown University . Sherwood also became a Jesuit priest with expertise in canon law and Gregorian chants. He became director of the Catholic seminary in Troy, N.Y., and rector of the Cathedral in Boston. Another brother, Michael, joined the Revenue Cutter Service (now the Coast Guard) and was promoted to captain. He patrolled the Alaska territory for 20 years. A hard drinker nicknamed Hell Roaring Mike, he married the daughter of an Irish immigrant who bore one child who survived, despite 18 pregnancies. Their three sisters became nuns, though one left the order , moved to Boston and married an Irishman. Eliza became Mother Superior at the Villa, a Catholic convent and school in St. Albans, Vt. This story about James Healy was updated in 2018. Thanks for this, it was fascinating! Hmmmm. The Rachel Dolezal of his time. It’s not as unusual as people think, to identify as another race, culture or gender. It’s one thing to identify; it’s another to be.